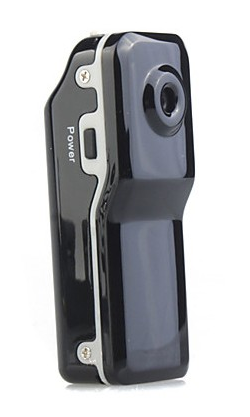 Mini DV Spy DVR Video Camera $12.99 Down From $49.99! Ships FREE! You are here: Home / Great Deals / Mini DV Spy DVR Video Camera $12.99 Down From $49.99! Ships FREE! GearXS has this Mini DV Spy DVR Video Camera on sale for $12.99 (Reg. $49.99) + FREE shipping! The Mini DV MD80 is the smallest digital video camera in the world! Smaller than a BIC lighter, and just about as inexpensive! It is very fashionable, wearable and matches all kinds of portable tools making it the perfect little spy cam unit. This camera records 720X480 video in AVI format at 30 frames per second. This AEE camcorder keeps away blur and distortions.